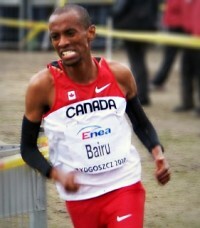 On his blog on September 20th, Simon Bairu announced the difficult decision to withdraw from this year’s Toronto Marathon, owing to what amounted to accumulated fatigue. The Canadian Record-Holder at 10,000m wrote, “As much as I would have loved to run in Canada in front of my friends and family for an opportunity to qualify for the Olympics I had to make the decision based on the fact that me at 75% isn’t gonna cut it against the clock and against a very accomplished field.” We spoke to Simon to hear more about what went into his decision, and how he thinks the race will play out. When did you and Jerry start having an inkling that racing Toronto might not be in the cards? The first inkling for me was after I DNF’d at New Haven, but [my coach] Jerry [Schumacher] wasn’t ready to hit the panic button just yet so we waited to see how my workouts went after the race. The workouts started to take a turn for the worse and so last weekend we decided Toronto wasn’t going to happen for me this year. Have you experienced anything like this accumulated fatigue before? And how do you think you got there, and how did you recover? The last time I experienced something like this was fall of 2009 as I was preparing for my marathon debut in NYC. At the time I was starting to run 120-mile weeks consistently for the first time in my career. It was a shock to the system and training started to suffer a bit because of it. We decided to scrap NYC but I did go on to have a great 2010 year! I think it’s a similar situation this year. I was tackling 130-mile weeks for the first time and now only time will tell if this is the launching pad to a great 2012 year! What do you think is the takeaway from this experience, as it applies to runners of all abilities? The need to schedule rest into one’s training? Listening to your body? I think the biggest take away from this is to make sure to incorporate easy days into one’s training. But most importantly don’t wait till you’re forced to take an easy day. Now that you can comment objectively, who do you think is the favorite going into the race? I’m friends with all the top contenders in the race and I wish them all a great race but if I had to pick one favorite it would probably have to be Reid Coolsaet. He ran 2:11:27 last year at this race so he knows the course well and he’s had a great build up this fall. I think it’s gonna be close but he’s a tough runner and I think he’ll get the top spot. Do you have a plan yet for next year, and if so, what might that be? Right now my only focus is getting ready for my next marathon. I’m not sure if that will be in December or early next year but that is the only thing on my mind right now.